Where is the place of knowledge in your business growth? Thinking about the correct answer, you can take a look at Ernst & Young’s report The Knowledge Advantage revealing an unexpected truth. “Being the most critical factor for business success, knowledge drives customer satisfaction and growth,” says the document. Moreover, 80% of business leaders prioritize knowledge over products and short-term financial targets. Showing the exceptional role of knowledge in business processes, the report proves that companies neglecting corporate knowledge are missing out on the opportunity to advance in their customer relationship management and increase revenue. However, to become a part of this positive statistics, companies should first go through a thorny path of knowledge management and learn how to turn their knowledge into a competitive advantage. Unfortunately, the reality is much tougher than it seems. According to Knowledge Management Institute, the failure rate for knowledge management initiatives goes as high as 50%. But why? Traditionally, theorists define 3 key components of successful knowledge management, which are people, processes and technologies. Indeed, the integrity of these components directly impacts the effectiveness of knowledge management strategy. Unfortunately, these components are quite frequently misbalanced: companies often focus on implementing knowledge management solutions only without neither involving people into the knowledge sharing process nor inscribing knowledge management into daily organizational processes. At the same time, there is one more important factor to consider before kicking off knowledge management initiatives. To ensure knowledge management pillars are stable, companies should prepare a solid foundation. In practice, it means that organizations have to go for in-depth evaluation of their current knowledge state, i.e. assess the knowledge they have and define key knowledge owners, existing knowledge gaps, etc. All this can be made through knowledge mapping that is the very foundation of a successful knowledge management process. Since knowledge is abstract, some companies might think that it’s impossible to apply any structural approach to knowledge management. In fact, knowledge can bring real value only when it’s managed structurally. In its turn, knowledge mapping is what brings structure to the knowledge management process and allows handling knowledge as a corporate asset. detect critical knowledge gaps that can negatively impact a company’s productivity. 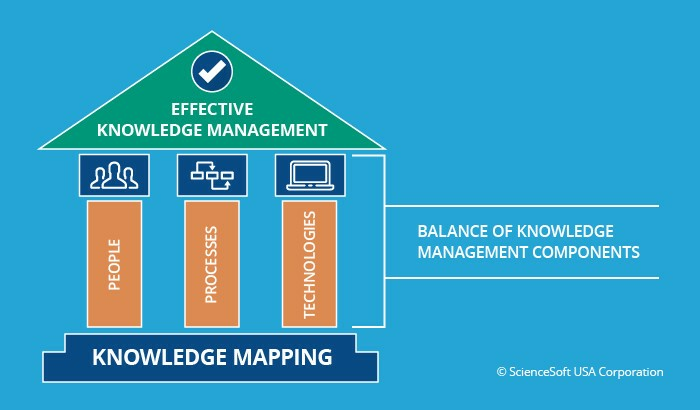 Delivering SharePoint-based knowledge management solutions, we at ScienceSoft consider knowledge mapping as an essential component of effective knowledge management that should be implemented as part of both a knowledge management strategy and a knowledge management system. The biggest benefit of knowledge maps is their ability to reflect both knowledge strengths and weaknesses. Guided with a knowledge map, a company can decide on acting more resolutely by harnessing their knowledge strengths, or initiate knowledge acquisition and distribution activities to patch knowledge gaps. Despite providing a range of advantages, however, knowledge mapping can become a mammoth task, since it requires a thorough analysis of both explicit and tacit corporate knowledge. Fortunately, there are several ways of making knowledge mapping less painful. Instead of embracing corporate knowledge on the whole, a knowledge manager can use a few tricks to complete knowledge mapping with fewer efforts and less time. Use a test group. Creating a comprehensive organizational knowledge map can be a long-lasting task without any guarantee of success. It’s always reasonable to start with a smaller map that will visualize the knowledge in a particular domain. With the optimal knowledge mapping techniques chosen, it will be then much easier to apply the same approach while creating a company-wide map. Create the most urgent map first. A full-fledged knowledge mapping is supposed to evaluate all types of corporate knowledge. It can include several types of maps such as strategic, functional, process-based, competency-based ones and more. Defining which type of a knowledge map will be the most efficient to solve short-term business goals can significantly reduce mapping timeframes while bringing more value. Start with mapping explicit or embedded knowledge. Externalized knowledge is always easier to deal with, so a knowledge manager can start with making knowledge maps relying on the company’s explicit, or embedded knowledge (knowledge tapped inside organizational routines, processes and products). Companies that plan to use a SharePoint-based knowledge management solution can consider integrating it with a business process management solution or enterprise systems to enable automated transfer of externalized knowledge assets (e.g. process documents, policies, guidelines). Facilitate knowledge mapping via integration with HRM. Such an integration can help those companies that prioritize competency-based knowledge mapping. Previously classified and sorted-out competencies and skills can be automatically applied to a knowledge map. Such an approach has its limitations though. Employees’ competencies aren’t equal to their knowledge and vice versa. That’s why a competency-based map should be expanded with other knowledge characteristics (e.g., availability of tacit knowledge). Apply iterative knowledge mapping. Knowledge mapping isn’t a one-time task but a continuous process aiming at enhancing the quality of corporate knowledge. Iterative knowledge mapping will allow to persistently eliminate detected knowledge gaps and launch new knowledge management initiatives to address the latest business challenges. ‘Every organization needs to put knowledge on their agenda. We believe the knowledge advantage is too important to ignore’, says Jeff Green, EY Global Knowledge Leader. Sticking to thought leaders’ recommendations, companies across multiple sectors focus on increasing the value of corporate knowledge and tuning their knowledge management tools. 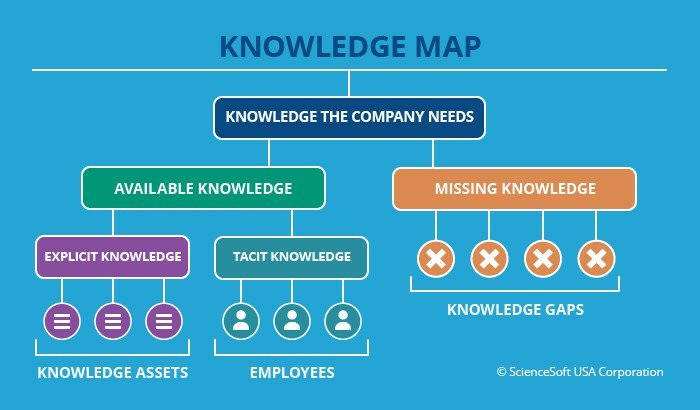 Knowledge mapping should become an integral part of a corporate knowledge management framework as it helps to take a deeper look at the organizational knowledge as well as make it easier to further outline targeted knowledge management activities. By Sandra Lupanava (SharePoint Evangelist at ScienceSoft).